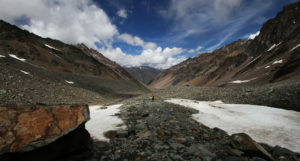 India is a unique travel destination with a variety of experiences to offer, but at times you just want to skip the crowds, avoid overly populated tourist destinations and venture into the unknown. If you are interested in travelling different areas then we recommend some fantastic unexplored places in India that are slowly making their way onto the travel map. This is a list of some of our favorite offbeat travel destinations in india. One great unexplored places in India is Chambal. The town is located in Central India, about one hours’ drive from Agra. Founded by the famous ‘Bandit Queen’ Phoolan Devi, the area was once infested with bandits and goons and has a rich, niche history unlike any other tourist destination. Of course, now it is quite safe for travelers. If you love wildlife then you must visit the National Chambal Sanctuary, home to a number of endangered species. 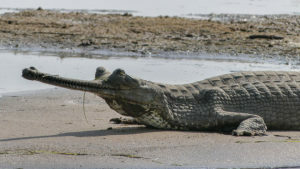 These include the Ganges River Dolphin, Gharial crocodile, and a number of other animals and migratory birds. Spend a day or two exploring this unconventional, untouched city located alongside the river. We further recommend you stay at the Chambal Safari Lodge, on your way to or from Agra, to get the most out of the wildlife around you. Wayanad is another offbeat travel destination located in the North Kerala district. The lush green landscape, majestic hills, valleys and the splendor of the countless breathtaking waterfalls captivate you. Clean and pristine, it is a perfect getaway from the busy city life. The quiet intimacy with nature makes it perfect for honeymooners. If travelling from Mumbai you must fly to Calicut, which is the closest airport. If coming from Cochin then you can either fly or take a train depending on what you prefer. To get the most out of the beauty of this mountainous district we recommend you stay here in the rainforest-secluded Vythiri Resort. The city of boulders may not seem offbeat for a few travelers but this is another one of those unexplored places in India away from the bustling tourist destinations. 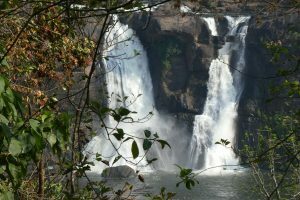 This UNESCO world heritage site is in the southern state of Karnataka, accessible from Mumbai, Bangalore, and Goa. 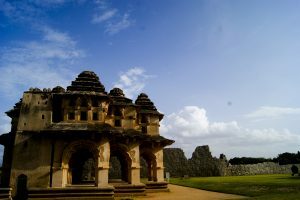 Hampi is one of the top backpacker destinations and is a mesmerizing town of ruins. Go cycling into the sunset, visit one of the many temples or simply curl up with your favorite book and enjoy the calm and fresh air. You can easily spend two or even three days in this offbeat travel destination and by the time you leave this paradise, you will be desperate to return! The mountains beckon! In the state of Himachal Pradesh, against the backdrop of the mighty Himalayas, lies nestled the town of Thanedhar. Wake up to an enthralling view of the mountains and valley of vividly-colored apple trees below that change color each season; a feast to the eyes. You can go for walks, hikes or simply laze around in the beauty that surrounds you. Drive from Shimla to Thanedhar and continue onwards to Sojha or Kasauli to reach the area. You will be amazed by the bliss of pure nature. Stay here at the Banjara Retreat and enjoy fabulous views from your room of this unexplored area in India. Another one of the offbeat travel destinations in India is Pali in the Marwar region of Rajasthan. If you’re looking to see rare wildlife species then opt for The Kumbhalgarh National Park in Rajasthan over Ranthambhore. The sanctuary houses many species such as wolves, leopards, hyena, and a range of vividly colored birds. You may even spot some crocodiles in the bargain. 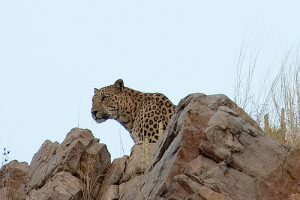 Located right between Jodhpur and Udaipur, it is really easy to reach and has a lovely luxury property you can consider for your stay (Jawai Leopard camp).